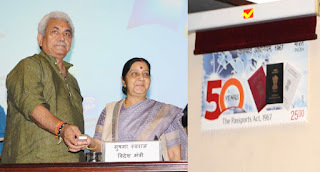 Home > Ministry of Communication & Information Technology > A commemorative postage stamp released on completion of 50 years of Passport Act. 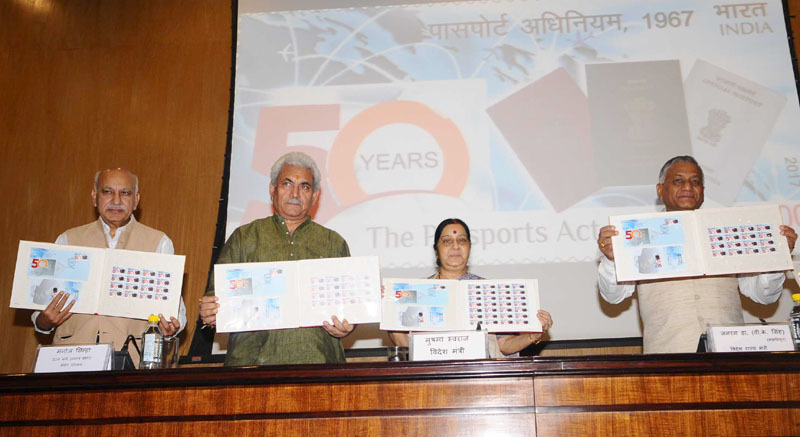 A commemorative postage stamp released on completion of 50 years of Passport Act. The Minister for Communications Shri Manoj Sinha said that the Passport Seva Project (PSP) has been a watershed in the history of passport issuance in India with its successful implementation in the Public Private Partnership (PPP) mode. The entire process of citizen service delivery has been re-engineered, standardized and automated. Speaking after releasing a commemorative postage stamp on completion of 50 years of “The Passports Act, 1967”, he said that services are delivered through a country-wide networked environment - integrating all Passport Issuing Authorities, around 91 Passport Seva Kendras, as well as providing access to a number of external stakeholders viz. Immigration, Police, India Post, India Security Press and Embassies/ Consulates abroad. 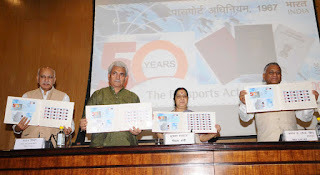 Shri Sinha said that 24th June 1967 marked an important milestone in the history of passport issuance in India as it was on this day that the President gave assent to the Passports Act 1967. The Passports Act provided a robust legal framework for the issue of passports and travel documents and regulation of the departure from India of Indian citizens. The Minister said that in order to extend passport services to our citizens on a larger scale and to ensure wider area coverage, the Ministry of External Affairs and the Department of Posts (DOP) have agreed to utilize the Head Post Offices in the country as Post Office Passport Seva Kendra (POPSK) for delivering passport related services to the citizens of our country. The pilot projects for this joint venture between MEA and DOP were inaugurated on 25 January, 2017 at Mysuru in Karnataka and at Dahod in Gujarat. Shri Sinha said, applicants, who apply for their passports online through the passport portal, can now schedule an appointment and then visit the designated POPSK to complete the formalities similar to those at the PSK necessary prior to the issue of the passport.